Brasília (AFP) - Luiz Felipe Scolari may have been the coach when Brazil won the World Cup in 2002, but his name will now forever be associated with failure and the worst result in the country's footballing history. The 65-year-old knew he was putting his legendary status on the line when he agreed to replace the sacked Mano Menezes in late 2012 and lead the Selecao into the World Cup on home soil. "The players know they will have to win the World Cup. We can't play a tournament in Brazil and think that second place will do," he said in an interview with British newspaper The Guardian late last year. He exuded confidence that Brazil could go all the way right up until last Tuesday's shattering 7-1 semi-final defeat at the hands of Germany, a reverse that broke numerous unwanted records. The 3-0 defeat to the Netherlands that followed in Saturday's third-place play-off in Brasilia ensured that the hosts' campaign ended in more disappointment. 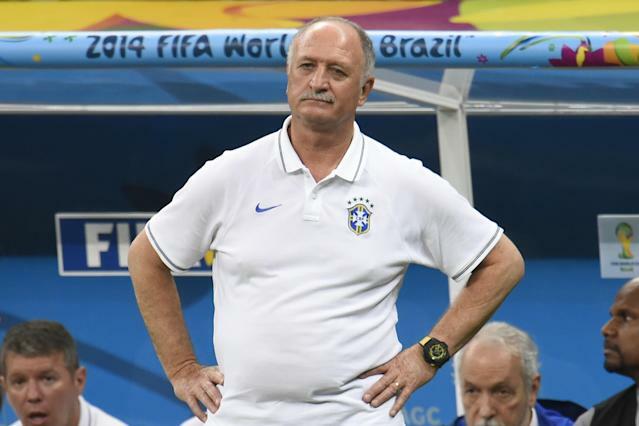 But Scolari insists that the Selecao's performance on home soil should be viewed in a positive light, and claims that he had no choice but to talk up his team's chances going into the competition. "I said in 2002 that if we finished in the first four we would be satisfied - but that was in Korea and Japan," he said. "We are in Brazil. If I said that this time I would be finished before I even started. "I see the positive side. Since we were last champions in 2002, this is the first time we have finished in the top four," he added, while continuing to proclaim the merits of his side, pointing above all to their triumph in last year's Confederations Cup. Having previously claimed that his team could win the World Cup, now he insists that he has brought on a young team that will stand Brazil in good stead when the 2018 tournament comes around in Russia. But the reality is that only five of this year's squad - Oscar, Paulinho, Willian, Bernard and Neymar - will still be aged under 30 by then. And Scolari will surely not be there. His contract is now up, but he has left a decision over his future in the hands of those in charge at the Brazilian Football Confederation, current president Jose Maria Marin and the future boss Marco Polo Del Nero. It has been suggested that they will ask Scolari to remain in charge at least until the end of the year to help Brazil prepare for the 2015 Copa America, with Del Nero this week telling newspaper Estado de Sao Paulo: "For me, he stays." However, Scolari's position seems untenable after the way they capitulated against Germany and Holland. His sides have in the past been based on a solid defence, but Brazil finish this World Cup having let in 14 goals, the most of any team at the competition since Belgium in 1986 and the most ever by a host nation. At the time of his appointment there was something of a clamour for Brazil to turn to Pep Guardiola, who was a free agent, but the response to Scolari's spectacular failure could be to look abroad this time. 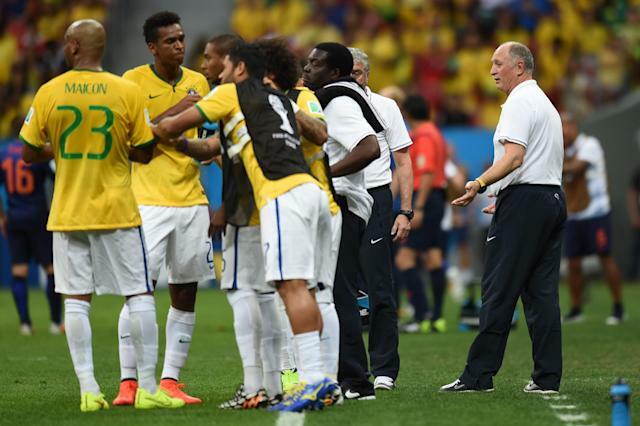 Scolari, though, dismisses suggestions that he has been left behind tactically by modern European counterparts. "When I won the Confederations Cup were people saying a European needed to come in and change things? "It is nothing to do with coaches, or directors. Our team has had some difficulties. This group was very good in the Confederations Cup and was very good until the semi-final," he said.